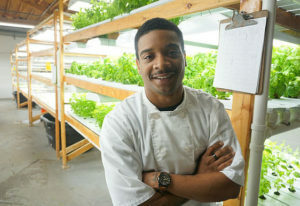 Darius Jones, general manager, vice president, and part of owner of Garfield Produce, an urban hydroponic farm located in Garfield Park, a west-side community in Chicago. Photo courtesy of Garfield Produce. Since its inception in 2013, Garfield Produce has been working to improve economic growth and employment opportunities for Garfield Park community members. The for-profit business was born from a collaboration between a successful retired couple, Mark and Judy Thomas, and an engineering major from DePaul University, Steve Lu. Through missionary work with the Breakthrough Urban Ministries, Mark and Judy saw that their misconceptions about poverty—that it is the result of laziness and not taking advantage of the same opportunities afforded to others—were inaccurate, according to Jones. What the Thomas’ discovered was that people did want to work, but there were no opportunities available and a number of systemic obstacles in place that hindered people’s ability to work. From the 1950s to the 1970s, Garfield Park changed from a predominantly Caucasian community to a predominantly African-American community, and most of the equity that existed has been removed over the past 25 to 30 years. As one of the top five communities in the city for crime rate and poverty, the infrastructure in the community has degraded, leaving close to 3,000 abandoned buildings and facilities and no real job opportunities, says Jones, a Garfield Park native. As a young company, the current focus is building the business and increasing its income to be able to support more entry-level positions. This action is happening through relationships with Chicago-area chefs, catering companies, and restaurants, and will possibly expand to include a relationship with Whole Foods, which has approached Garfield Produce about carrying its products in their stores. Garfield’s vertical hydroponic farm, housed in a 5,600-square-foot facility, yields approximately 2,000 to 5,000 pounds of 25-30 varieties of specialty micro greens and micro herbs, such as pea tendrils and greens mixes, a year. The farm’s production modules currently occupy only 320 sq ft. Another 2,200-square-foot grow room is in development, which will increase production to 21,000 pounds a year and add another five to 10 varieties of greens. The hope is that this greater yield will translate into more income, allowing the company to increase their workforce from two—Darius and one grower—to approximately 11 with the addition of another grower and grower’s assistant, a sales position, and six more entry-level positions. The main challenge in employing members of the community is finding people with enough knowledge and training. The company hopes to overcome this impediment by working with local organizations that do job training for the area’s large number of people with felony convictions, which accounts for 65 percent of the population, according to Jones, who went through a similar job-training program seven years ago. The company also continues to work with Breakthrough Urban Ministries, which, as well as providing men’s and women’s shelters, a food pantry, and a healthy food kitchen, supports the people in their housing program with entry-level job training. The one employee besides Jones was found through the ministry’s men’s shelter in 2014. The partnership with the ministry also includes donations of leftover harvested greens to the food pantry. Jones would love to expand this partnership to include more activities, such as food demos, but admits that part of the downside of a for-profit business is a lack of logistical feasibility to get out and educate the public with efforts that are not sales-based, an issue that also influences their customer base. “We don’t have the manpower to be out marketing and educating the community about our products. So, right now, we are looking to bring dollars into the business, get it built up, and then start pushing the products into the community,” says Jones. Jones wants the business model to be scalable, sustainable, and replicable so they can take it to another of the many underutilized facilities on the west side of Chicago and build the same footprint using the same sales channels to make it profitable for other communities. Garfield Produce will begin opening its doors to community members for tastings soon and hopes to increase its education efforts by working with local schools. The company is already in partnership with Nick Greens Grow Team, a group specializing in hydroponic and controlled-environment agriculture, to sponsor hydroponic systems in schools so students can learn the importance of growing their own food and use the food they grow in their lunches.